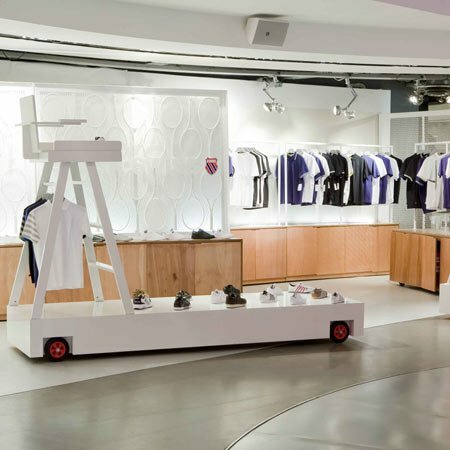 Amsterdam-based UXUS Design have created a "pop-up" store for sports show brand K-SWISS at Citadium in Paris, France. The store is formed of “floating” tennis rackets and an umpire chair. K-Swiss commissioned UXUS to create a pop-up area within Citadium, Paris. K-Swiss wanted to heighten brand awareness and help push product sell-through over a one month period. The concept was directed towards Paris’ more fashionable, sneaker oriented customer base. The K-Swiss area reinforced not only the brand identity of K-Swiss but also it’s history and core values. The space communicated K-Swiss as a premium brand which stands for authenticity, quality and a timeless approach. The area is a flexible showcase that can deal with the requirements of both product sell-through and music oriented events. Using the vernacular of tennis related objects; UXUS formed a shop out of “floating” tennis rackets and an umpire chair. The tennis rackets also served as a projection screen for images during music events. Founded in Amsterdam in 2003, UXUS is an international multi-disciplinary creative company specializing in the fields of: Interiors, Architecture, Retail, Hospitality, Identity, Graphics and Packaging. Our multi-disciplinary structure, with teams from different disciplines working together, promotes a culture of interchange and adds tremendous value to the creative process and result.